Inter Milan came from behind to beat Juventus in an exciting derby d'Italia. Stephan Lichtsteiner gave the visitors the lead after the break when he tapped home a low cross from Alex Sandro. However, Mauro Icardi equalised for the hosts just two minutes later with a header from a corner. 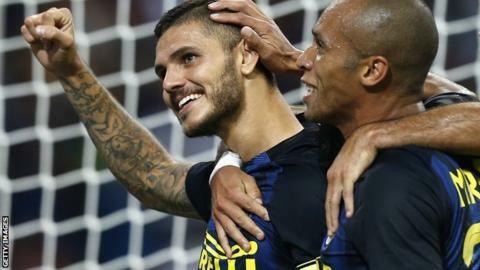 Substitute Ivan Perisic headed Inter in front after fine work from Icardi, and Juve - with Gonzalo Higuain on from the bench - could not find an equaliser, despite Ever Banega's late red card. The result was only Juve's second Serie A defeat since they lost 1-0 to Sassuolo on 28 October, 2015. The loss means the champions slip to second, behind Napoli, while Inter move up to sixth. Frank de Boer only replaced Roberto Mancini in the summer but there were rumours that defeat on Sunday could have seen the Dutchman removed from his position as Inter boss. The Nerazzurri were embarrassed 2-0 at home by Hapoel Be'er Sheva in the Europa League on Thursday, a result that prompted the former Ajax boss to apologise to fans and claim his side "lost their heads". His position looked even more precarious when Switzerland international Lichtsteiner gave Juve an undeserved lead with 65 minutes on the clock. However, Icardi powered home a fine header for his fourth league goal of the season and then showed great composure to pick out Perisic with a cross with the outside of his foot after rounding goalkeeper Gianluigi Buffon. It was a generally disappointing performance by the Turin side, champions in each of the past five seasons. They had a great chance to take the lead in the first half when Sami Khedira headed straight at Samir Handanovic from six yards. Higuain, the £75.3m summer signing from Napoli, was brought on with the scores at 1-1 but the Argentine's only chance saw him glance a header narrowly off target from a Sandro cross. Inter forward Banega was sent off in the final minute for picking up a second booking but despite piling men forward Juve could not find a leveller in injury time. Match ends, Inter Milan 2, Juventus 1. Second Half ends, Inter Milan 2, Juventus 1. Attempt missed. Paulo Dybala (Juventus) left footed shot from outside the box misses to the left. Attempt blocked. Paulo Dybala (Juventus) header from the centre of the box is blocked. Assisted by Alex Sandro with a cross. Second yellow card to Éver Banega (Inter Milan) for a bad foul. Foul by Éver Banega (Inter Milan). Offside, Juventus. Miralem Pjanic tries a through ball, but Alex Sandro is caught offside. Attempt blocked. Ivan Perisic (Inter Milan) right footed shot from the left side of the box is blocked. Assisted by Éver Banega. Éver Banega (Inter Milan) is shown the yellow card. Attempt missed. Miralem Pjanic (Juventus) right footed shot from outside the box is too high from a direct free kick. Attempt missed. Gonzalo Higuaín (Juventus) header from the centre of the box is close, but misses to the right. Assisted by Alex Sandro with a cross. Substitution, Juventus. Marko Pjaca replaces Giorgio Chiellini. Attempt saved. Ivan Perisic (Inter Milan) left footed shot from the left side of the box is saved in the top centre of the goal. Assisted by João Mário. Substitution, Inter Milan. Senna Miangue replaces Davide Santon. Goal! Inter Milan 2, Juventus 1. Ivan Perisic (Inter Milan) header from the centre of the box to the bottom right corner. Assisted by Mauro Icardi. Davide Santon (Inter Milan) wins a free kick on the left wing. Substitution, Inter Milan. Felipe Melo replaces Gary Medel because of an injury. Substitution, Juventus. Gonzalo Higuaín replaces Mario Mandzukic. Antonio Candreva (Inter Milan) wins a free kick in the defensive half. Substitution, Inter Milan. Ivan Perisic replaces Éder. Goal! Inter Milan 1, Juventus 1. Mauro Icardi (Inter Milan) header from the centre of the box to the bottom right corner. Assisted by Éver Banega with a cross following a corner. Goal! Inter Milan 0, Juventus 1. Stephan Lichtsteiner (Juventus) right footed shot from very close range to the centre of the goal. Assisted by Alex Sandro with a cross. Foul by João Mário (Inter Milan).